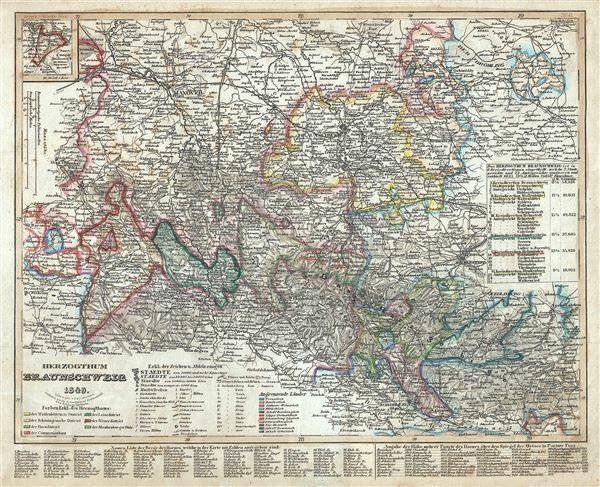 This is a fine 1849 example of Joseph Meyer's map of the Duchy of Brunswick, Germany. It covers the historic German state from Gardelegen to Blomberg and south as far as Nordhausen. Throughout the map identifies various cities, towns, rivers and an assortment of additional topographical details. Established in 1815 by the Congress of Vienna, it would later become part of the German Confederation, the North German Confederation and later the German Empire. Very good. Overall toning and foxing at places. Map pasted on verso.